If you are a Canadian citizen and would like to sponsor your spouse for permanent residency in Canada, you certainly have opportunity to do so. As you may have already known, you may apply for a spousal sponsorship application, given the fact that you are eligible. However, you may be wondering if there is any way by which your spouse can legally work in Canada. The answer is yes, but you will need to determine which method your spouse will use in terms of working in Canada prior to sponsoring them to Canada. There are certain ways that you may use to allow your spouse to work in Canada. This blog will explain the ways in which your spouse can work in Canada as well as the different options available to your spouse if they intend on working in Canada. If you are sponsoring your spouse with the Inland Spousal Sponsorship, the process is not as complicated as the one for Overseas Spousal Sponsorship. The Inland Spousal Sponsorship is processed in two different stages. In the first stage, the Immigration officer examines the Canadian spouse’s ability and eligibility to sponsor their foreign spouse. After that, the Immigration officer will then examine whether or not the foreign spouse has any inadmissibility to Canada. After the first stage has been completed, the foreign spouse may be eligible to apply for an Open Work Permit. An Open Work Permit allows the foreign spouse to work for any Canadian employer, anywhere in Canada. Additionally, for any foreign spouse that is self-employed, you may also be self-employed in Canada under the open work permit. This is the advantage of Open work permits and Inland Spousal Sponsorship, as the foreign spouse will be able to work for anyone and anywhere in Canada, while the spousal sponsorship application is being processed. You will be informed by the Immigration officer ahead of time in regards to applying for the open work permit. Please note, if you need to work urgently, you may also apply for the open work permit at the same time as your application for permanent residency. Applying in the first stage can be extremely useful for the foreign spouse who is already residing in Canada and is temporarily working. Consequently, they will be granted an implied status, meaning they can continue working in Canada, even if their current work permit expires. The implied status simply means the foreign spouse may continue to work until they receive a decision for their Open Work Permit. Overseas Spousal Sponsorship, on the other hand, does not allow the foreign spouse to apply for an open work permit. Do not be intimidated by this fact, though. The foreign spouse that is currently residing outside of Canada may still be eligible to apply for a regular work permit, rather than the open work permit. The requirements and conditions for a work permit are stricter than the open work permit. In order to apply for a work permit, the foreign spouse must first obtain a valid job offer from an employer inside Canada. The Canadian employer must also obtain a positive Labour Market Impact Assessment (LMIA) before the foreign spouse can request the work permit. Another option for the foreign spouse may be to apply under one of the Federal immigration programs, such as the Federal Skilled Worker Program; the Federal Skilled Trades Program and/or the Canadian Experience Class. However, this entirely depends on the score present on the Comprehensive Ranking System (CRS). The CRS will examine the foreign spouses’ age, profession, language ability, education and nationality. It is important to note that foreign spouses that apply for a work permit should remember that temporary work permits are only permitted to individuals who intend on exiting Canada at the end of their authorized period of stay in Canada. 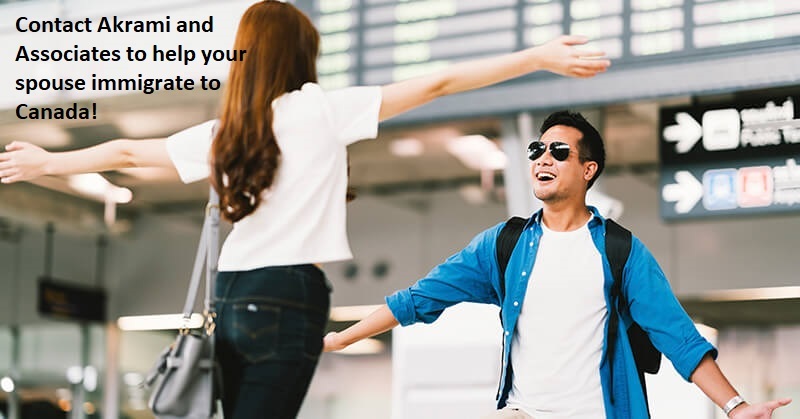 If the foreign spouse does not show the Immigration officer his or her intention to leave at the end of their authorized stay, the immigration officer may refuse the application. Consequently, it is extremely important for the foreign spouse to show the immigration officer his or her ample ties to the home country. The ties may be properties owned in the country of origin, family, education, and many more. The foreign spouse can formally address “dual intent” to prevent the application for a work permit from being refused. The meaning of dual intent is that it can be possible to obtain a temporary resident visa, or in this case a work permit, while waiting for the permanent residency application to process. Please keep in mind, the immigration officer has the right to revoke your dual intent, causing the refusal of the work permit application. Fortunately, this will not affect the permanent residency application moving forward. If you are a foreign spouse and wish to work in Canada, but are unsure of which route to go with, no problem! Akrami & Associates can assist you with the process and determine which option is best for you. Applying for spousal sponsorship and a work permit may be confusing, or sometimes, overwhelming. As a result, it is highly recommended that you seek out professional and experienced help before attempting to apply for a work permit or an open work permit. Akrami & Associates work and have experience with many different immigration issues. We have helped many of our clients work in Canada and contribute to the Canadian economy alongside their Canadian spouse. Please feel free to contact Akrami & Associates at 416-477-2545 for more information, or if you would like to book a consultation with an immigration professional for more advise.